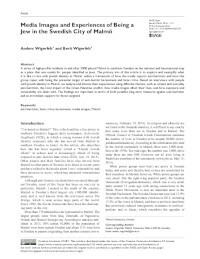 A series of high-profile incidents in and after 2008 placed Malmö in southern Sweden on the national and international map as a place that was unsafe for people identified as Jews. The primary aim of this article is to explore and exemplify what it is like to live with Jewish identity in Malmö within a framework of how the media reports anti-Semitism and how this group copes with being the potential target of anti-Semitic harassment and hate crime. Based on interviews with people with Jewish identity in Malmö, we analyze and discuss their experiences using different themes, such as violent and everyday anti-Semitism, the local impact of the Israel–Palestine conflict, how media images affect their lives, and how exposure and vulnerability are dealt with. The findings are important in terms of both possible long-term measures against anti-Semitism and as immediate support for those targeted.